The Live Performance is on October 31st, and runs about 90 min. not including a brief intermission. Come in a Costume or casual, the staff will be dressed for the occasion. The show contains suggestive language, and content with an R rating, due to the nature of the show no one under 17 will be permitted. The Show will get started at 8:00 and we ask that you be here at 7:30 to get your seats and drinks. The doors will be locked at this time as not to have any interruptions during the performance. Appetizers and bread will be served before the first act and dinner will be served during intermission. 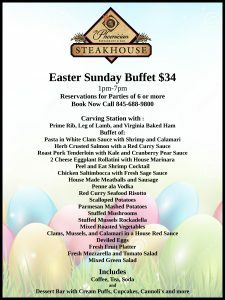 Everything will be served family style so you don’t have to make a decision on what to eat. The Appetizers being served will be Eggplant in a Marsala sauce with fresh mozzarella, Stuffed Mushrooms (vegetarian), and Mussels in a white Wine and butter. The entrée platters will consist of Penne ala vodka (vegetarian), Chicken Saltimbocca, Sliced Flank Steak, with mixed veggies and mashed potatoes on the side. The price includes coffee, tea and soda but all alcohol and other specialty drinks will be an extra charge. Our staff will run a tab for your table’s drinks. Tickets will only be sold in advance, and are $55 dollars, seating is limited. All profits from the ticket sales will be donated to the local not for profit Shandaken Theatrical Society AKA STS Playhouse. We will take your cash or card number at the time of purchasing the tickets and we will hold your tickets under the reservation name. The theater will be selling tickets for raffle prizes, and there will also be a collection Jar at the front door for any additional donations. To end the night we will have a meet and greet after party with the cast in the bar area. Which all love the playhouse, and donate a lot of time to put on the fantastic shows we have been seeing as of late. 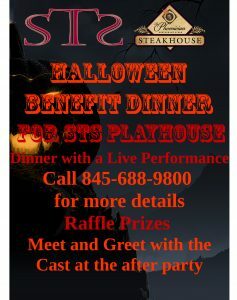 So please join us in supporting the theater and have a fun filled evening for Halloween this year. Please call 845-688-9800 for your show details and to order tickets. Reserve your table now for a romantic Valentine’s Day dinner for two. Book your reservations now for Valentine’s day evening. There is no better occasion to experience our porterhouse for 2 or zuppe for 2 on the menu. Our seafood is shipped fresh from NYC twice a week, and our steak selection includes prime choice, grass fed, and all natural cuts to choose from. We will be featuring specials that evening for romantic couples to enjoy together. Our pastry chef will be baking some delicious desserts from scratch, for your special night out.